We are the prominent manufacturer and suppliers of wide range of PVC Wire cutting and Stripping Machines that are used in various electrical wire manufacturing industries .These are available in different specifications with respect to electrical wires. 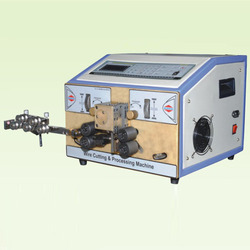 We manufacture these PVC Wire Stripping Machines as per the Industrial standards. We also do customization of these PVC Wire Stripping Machines as per the client’s requirement following national and international quality standards. 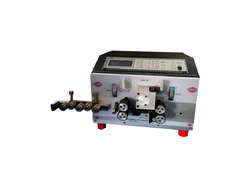 Fully automatic machine suitable for cutting and stripping of single core wire and flat cables. Machine for wires from 0.2mm to 3.0mm OD single core PVC wire. Fully automatic machine suitable for cutting and stripping of single core wire and flat cables. Machine for wires from 0.2mm to 2.5mm OD one time two core PVC wire. Separate 'power & contaol' panel to suit hot & humid weather conditions. Fully automatic machine suitable for cutting of single core wire, this machine make wire 0.2mm to 2.5mm double wire and 2.5 to 6mm single wire one time. Encoder feedback foe better accuracy. We are engaged in manufacturing and supplying large gamut of PVC Wire Cutting Machines such as PVC Wire Stripping And Cutting Machines. These are fully computerized machines offering high resolution digital display with new improved safety features. It has a facility of stopping automatically as soon as the coil ends. These are manufactured by using state of the art technologies under rigid norms of quality and are available at reasonable rates. Looking for PVC Wire Cutting and Stripping Machines ?